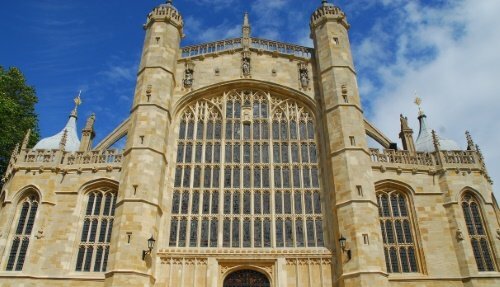 Our Cotswolds and Blenheim Palace tour departs from both London and Oxford, transporting you into the heart of the English countryside. 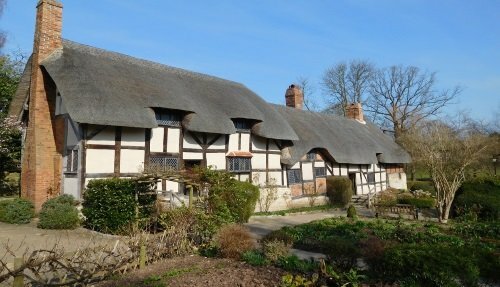 We’ll drive through pretty villages from a bygone era, admire charming thatched roofed cottages, and enjoy the gorgeous scenery of the region. 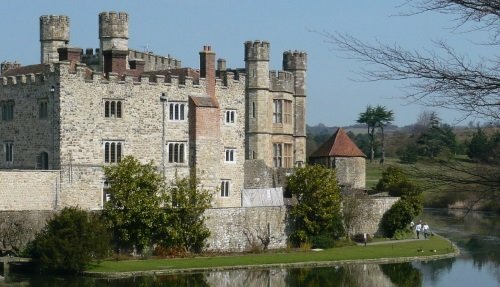 Our small group excursion includes luxury transportation, an expert tour guide and lunch in a traditional English inn. 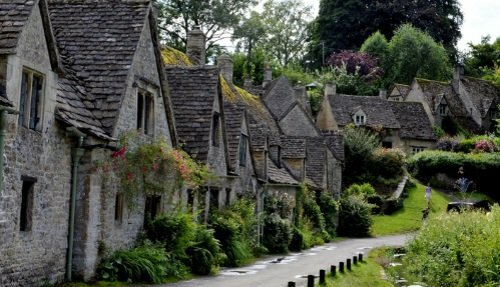 Spend the morning visiting some of the most inspirational Cotswolds villages including Stow-on-the-Wold, Bibury & Bourton-on-the-Water. We will then head to the medieval town of Burford to have lunch in a traditional English pub. The afternoon begins with a relaxing drive along the narrow and windy country lanes to arrive at Blenheim Palace. Here, we’ll enjoy a guided tour of the magnificent state rooms, with free time to explore the gardens. Our small group tour operates with a maximum of 16 passengers and is available every Saturday from April to October. We pick up in three convenient locations in Central London, as well as in Oxford town centre. 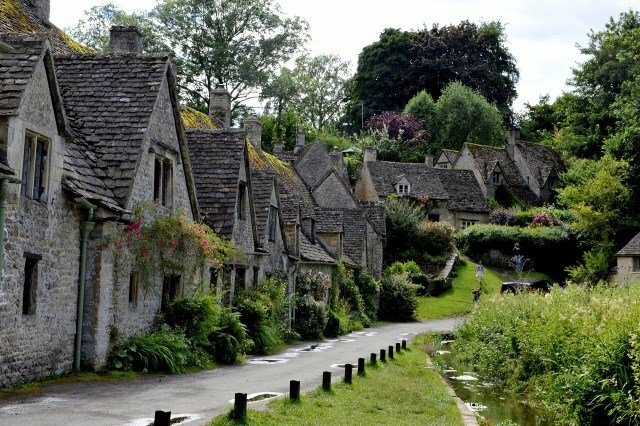 The charming village of Bibury! 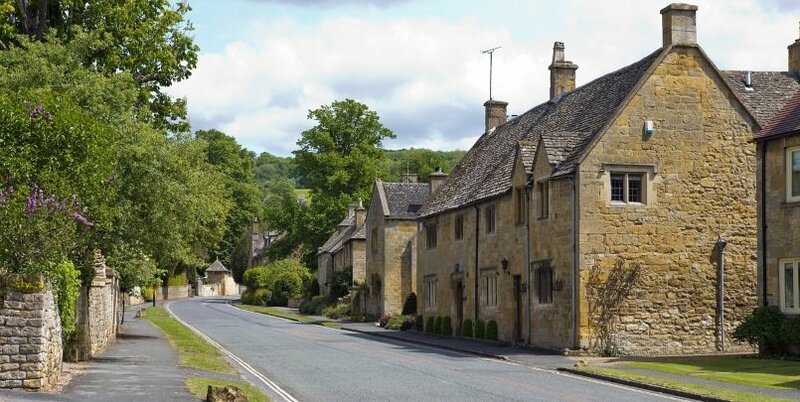 Visit Stow-on-the-Wold, the highest town in the Cotswolds at nearly 800 ft. Enjoy a guided tour arounds its charming market square and along its narrow cobbled streets. Take a spectacular journey through the Coln Valley, admiring the extraordinary landscape along the way. We’ll stop at the 13th Century stone church at Coln St Dennis before heading to Bourton-on-the-Water, nicknamed by locals “Little Venice”. Bourton is considered one of the prettiest villages in England, surrounded by fields and the River Windrush that runs through it. Arrive at Burford where your guide will lead a tour of the market town. 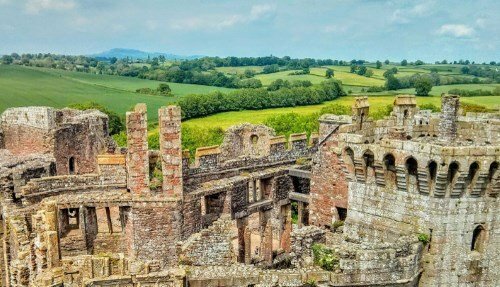 Here we’ll enjoy an English pub lunch in a traditional inn, and there’ll also be time to explore its 900-year-old church and admire the stunning buildings. Following lunch, we spend the afternoon at Blenheim Palace, the birthplace of Winston Churchill and a UNESCO World Heritage Site. Explore the incredible interiors and landscaped gardens on a guided tour of the palace, with free time to explore one of the finest country houses in the UK. 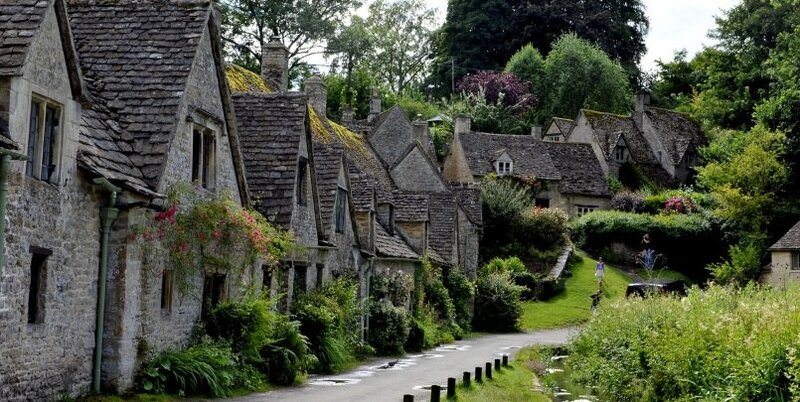 The Cotswolds is one of the prettiest places to visit in England. We use specially designed small minibusses that are able to go into the heart of the countryside and drive through winding, twisty narrow country lanes that are typical of the area. This will give you a true feel for the ‘authentic’ England. The minibusses that we use on this Cotswolds tour from Oxford are also custom made with extra windows on all sides of the vehicle, which means that you won’t miss a thing! We’ll drive along narrow roads, passing lush green fields, farmers herding sheep, and cows grazing in meadows, giving you a real taste of the area! We’ll visit some of the prettiest towns and villages in the region. Places like Burford, Bibury & Bourton-on-the-Water. 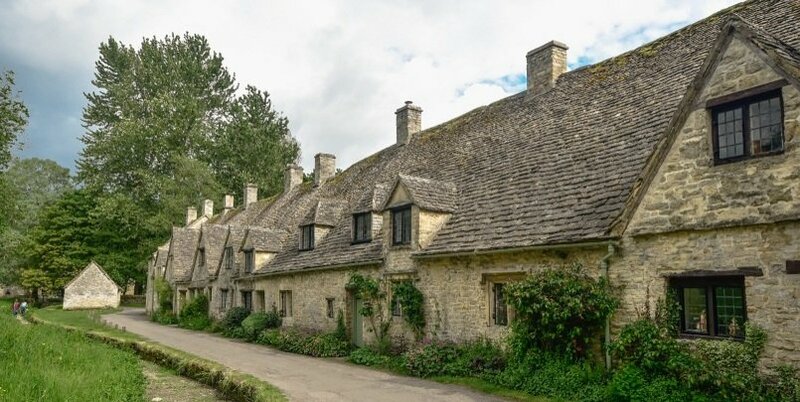 These places all contain the typical features of a true Cotswolds village, including thatched roofed cottages and local limestone buildings. Our expert tour guide will lead you around these villages and will explain the rich history and heritage of the area. Blenheim Palace is a UNESCO World Heritage Site and one of Britain’s most important country homes. It is a masterpiece of Baroque architecture and is known for its stunning State Rooms and magnificent landscaped gardens. Blenheim Palace is also the birthplace of Sir Winston Churchill, and his memory is honoured in the Churchill Exhibition and the Formal Gardens. 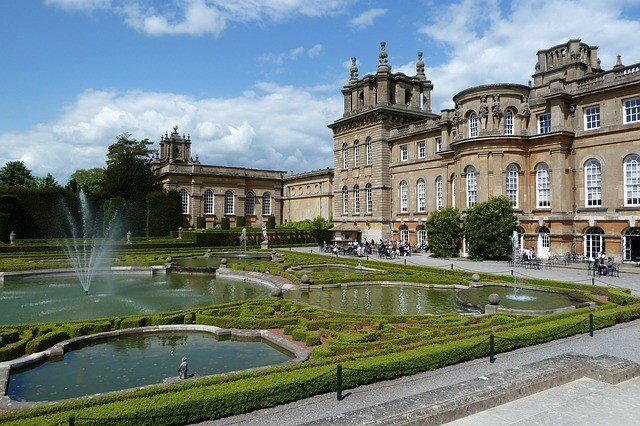 On this Cotswolds day tour from Oxford, your expert tour guide will lead you around Blenheim Palace, explaining its grand history and heritage. This will be followed by some free time for you to explore the gardens.